Reviews and opinions are mixed about Qantas airlines, if only because the airline operates so many different types of routes with different classes and different styles. Long haul in business you may get a great service: in economy on the "bus-route" from Sydney to Melbourne during the day you may have a totally different opinion - and on that same route in the evening with free food & wine, you may think yet again. With Qantas, more so than on any other airline, it pays to know what you're getting. And do remember that famous Qantas inconsistency: what you get one day, may be a different load of mileage the next. Qantas Economy Class on Qantas is fairly good, although it is hard to escape the herd mentality as you get on board, so no change from usual. There are no newspapers, nor hot towels. 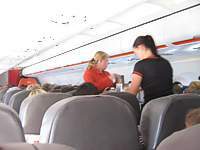 The meal service starts about an hour after takeoff, with two trolleys down both aisles from front to back, offering first the drink service, and then about 45 minutes later the first of the meal service. This is particularly un-hurried, and it can be a couple of hours in before you get your food. On the A380 there are now walk-up self service bars in economy, and these are well worth it, offering soft drinks, fruit and sandwiches. In Qantas Economy Class get to the bars early: passengers tend to raid them early in the flight. As you'd expect Qantas Economy is better than cheap American carriers, but doesn't offer quite as many frills as the Asian airlines. Qantas Premium Economy Class is certainly a step up from Economy, and it's sold as 'business class lite'. It's not, and you don't get access to the lounge, but you can checkin in premium, and you do get to board with all the other premium passengers, and then are offered pre-take off drinks (Australian Sparkling wine, Orange Juice or water), along with hot towels. Immediately before departure orders are taken for take-off drinks and meals service. And this again is slightly better than economy, with tablecloths, but then you get almost the same economy meal service. There is a slight upgrade (for example with a slight better full cooked English with bacon, whereas plain economy just gets a sausage. 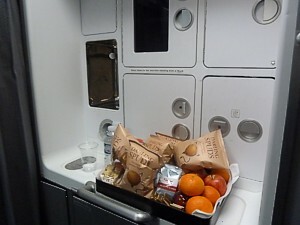 Every two hours the crew come through the plane offering a snack service with choice of chocolate, nuts, fruit, biscuits and drinks. But that's it. You do however get access to the Premium Economy inflight snack-bar, which again is just slightly better than the economy offering. 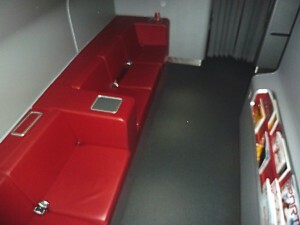 Qantas Business Class is much better than you'd expect, once you get over the egg-shell like look of the seats. This is certainly a major downside, and you are not shown to your seat or greeted by name, however once onboard the pre-flight Sparkling Wine is readily offered, as are your slippers and blanket, and your jacket hung. On night flights there is also a breakfast menu left hanging on the coat hook of your seat, and you can select what you'd like for the following morning. Cabin crew can make or break the flight, and are notoriously a bit random. There is no way of knowing if it'll be a great flight, or one where you have to chase after everything. Newspapers are offered, and this often includes from London a copy of that day's Sydney Morning Herald, which is now printed in London (with a special Qantas Edition logo on the cover) This is much better than the old edition that was faxed to London. On some routes you may also get a Financial Review. Later in the day these papers are to be found in the newspaper rack (which is above the staircase on the 747). Meal service is leisurely, from front to back, with first drinks, then starter, main, and the two options of deserts. Getting drinks can take quite a while, and if you like to have a drink on the plane, particularly on the 747, it can make sense to take a seat on the lower desk where you are next to the in flight bar. The Business Class Skybar is, oddly, much better on the Boeing 747 than the Airbus A380. 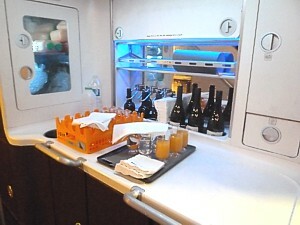 It is re-stocked throughout the flight, and even includes some very good late night chocolates, however the Boeing 747 has a much better stock of wine, and feels more spacious: it is designed for a standing up drinking experience. 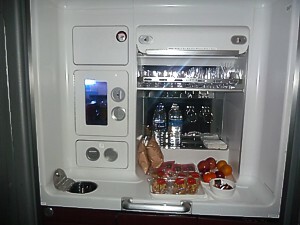 Indeed, on some overnight A380 flights it isn't stocked with wine at all, and you have to ask the crew. The A380 does however have a business class lounge area, right behind the cockpit at the front of the plane: it is a great place to hang out and stretch your legs on the two large red leather sofas, infront of the large TV (larger than at your seat). Get there early in the flight to reserve your spot though: it tends to be taken over by families and then children after the meal service. The Qantas First Class experience is very good indeed, with a deferential service that also is chatty if you want it to be. Of course you can board the plane when you want, and with two airbridges you can wander on without being held up by those in economy. The crew will show you to your seat, and greet you by name, taking your jacket and offering you a paper: at remote ports it can be a great delight to get a Sydney Morning Herald. 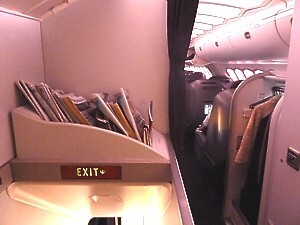 Papers are held in a stack at the front of the cabin (A380) or on the middle ledge (747). Menus, amenity kits, slippers and pyjamas all come around at this point: make sure you get them if the crew forget you. Headphones are in the small semi-circular drawer. The crew will also explain the IFE (which is turned on while on the ground) with the screen on motors that comes out from the wall, the electric window blinds, and the special rotating seat (in the A380 F suite). You'll be offered Sparkling Wine, orange juice or water. Once in the air, service is quick: if you just want to eat & sleep you can opt for the quick menu, but most people go for the 8 course tasting menu, designed by Rockpool. This can take about 3 hours to go through properly, and ends with coffee and Baileys. There is a small pillow and a blanket on the seat if you just want a nap: however, there are much better ones for sleeping. 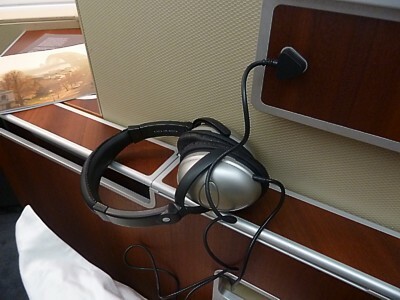 The crew will of course make your bed for your - even on a day flight, and even just for a few hours - however it may be much quicker to just reach up into the overhead locker and grab your mattress cover, thick pillow and a cotton duvet. Economy. Expect few frills. There is a drinks service before the meal (rememebr you have to pay, unless you are on the CityFlyer service after 4pm on weekdays when there is free booze), with just one run up the isle with the trolley, and thats about it. Newspapers are not brought round. 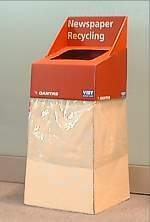 However there is a bin outside each landing gate for you to recycle your paper when you land - its worth a delve in here before you take off to see if there's a decent copy someone's left behind. Seriously - many people do this, and there is nothing to be ashamed about. On long haul domestic services to & from Perth and the East Coast, you'll get a much better service in economy, particularly on the A330 services. There are four trolleys that start in opposite corners of the cabin, and work inwards: for this reason you should not sit in the middle, and the back rows are actually the best. These hand out the hot meals on a tray (on all flights) and drinks (free alcohol after midday). The coffee & tea service makes an appearance (from the front of each cabin) and then the trolleys return with another drinks service (again from the front of each cabin). Half way through the flight, icecreams are handed out. Throughout the flight you can ask for top up drinks, and there is actually a small hatch to the left of the rearmost galley on the A330 where a small self service bar is set up for economy. Business. There are fewer frills than you'd expect, although inconsistency - a common Qantas trait - comes to the fore here. Sometimes you are greeted by name, and offered drinks before takeoff, along with hot towels. Alas sometimes one or all of these frills are missing. However newspapers are brought round on a trolley just after takeoff. On 767s and A330s this service starts at the front left, so if you're sitting at the rear right, the selection will be getting pretty low. Normal offerings include the Sydney Morning Herald, Financial Review, and Courier Mail, with occasionally the Australian, and the local paper for the origin point. For example from Darwin that would be the Northern Times. The menu is pretty comprehensive, with the meal service one side and the drinks on the other, although the wine list doesn't indicate the drinks available on the flight. You are only greeted by name when your meal order is taken. Drinks service is slow, however proper glasses are used, and there's even Crown, in real bottles. 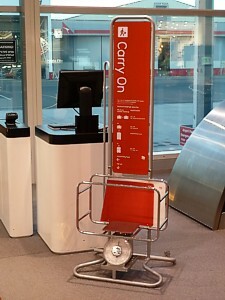 For Qantas' Cityflyer services, newspapers are left on a rack by the gate for both business and economy in the early morning. They are left there for the first flight of the day, so most tend to go by about 9am, however there seems to be no control over who takes which papers from which rack - so if all have gone from your gate, you can normally scout around the airport until you find a free paper. 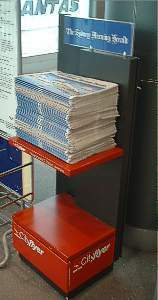 On the racks, the local papers (such as the Sydney Morning Herald or The Age) is left on the top rack, and The Australian is on the bottom half of the rack. Make no mistake, Jetstar is no Qantas, although there is a confusing overlap. On the Qantas site you can book Jetstar flight, but you can't book Qantas flight on the Jetstar site. Some routes have both services. And if you are an international customer, you can book a Qantas codeshare on a Jetstar plane. Infact, this is worthwhile, becayse all Qantas codeshare passengers in economy class will be offered complimentary "feed me" pack (meals and a beverage), blanket and headset for audio and in cabin movie. If you book via Jetstar, you have to pay. And paying is what what Jetstar is all about. You can't get much for free, except, oddly, seat assignments at booking. You have to pay for food and drinks for a start. The service starts at either end of the cabin, and ends over the wing. 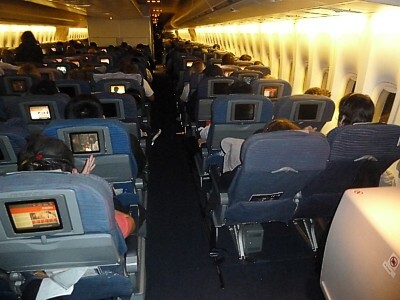 This can sometimes take a long time, so if you plan to eat on the plane, you may want to sit at the back. 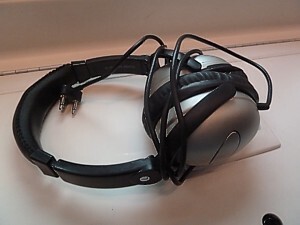 You can also pay for a headset (A$3 domestic, A$5 international) although you can cheat and just take your own with a 3.5mm mini jack, blanket (A$9), and video unit (A$10 domestic, A$15 international). There is no interlining of luggage from Jetstar to Qantas services. You have to lug it about yourself. Your boarding card colour is pretty important. If you check in early you get a Blue one, and can board early. Everyone else gets a silver one, and has to join the scrum. If you pay extra for a Jetflex ticket, you get an Orange boarding card, and can saunter onboard whenever you like, or at the head of the queue. 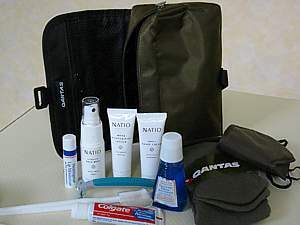 Qantas are pretty generous when it comes to their handouts for longhaul, and regularly revamp their amenity kits, so that regular passengers now have a set of various types, as they age throughout the years. 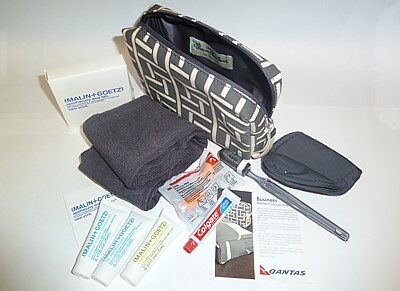 The latest version of the Qantas First Class amenity kit is a delight, and really shows that Qantas have gone to a lot of effort to design an amenity kit that works, and it is just what you want on the plane. It is designed by Payot Paris, and comes in a Male and Female version. The major difference is that the female version comes with a hair brush and a mirror. The male version has a comb shaving foam and a razor. The bag is also different: it's a Payot clutch-style bag for women, while for men there is one of the best designed amenity kits bags of any airline: it is a lovely fold out travel bag. The bag of course containts lots of skincare products: There is a Payot moisturised and eye balm, plus a lip balm. There is a large tube of toothpaste - larger than most airlines provide - and a deodurant. Naturally there are eyeshades too. In effect, Qantas have worked out what people want on a plane: not something to take home, but something to freshen up with on the plane. It is well designed, and well implemented. 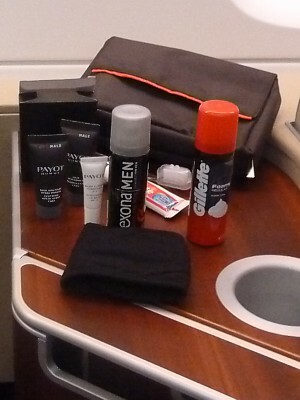 The latest amenity kit was brand new for 2011, and the new Business Class amenity kits are much classier than the old ones. The Qantas Business Class washbag features the work of iconic Australian designer Florence Broadhurst with Oriental Filigree and Hollow Squares designs on the outside: it really does look very good, and that's before you get to the contents. There is a pretty luxurious range of unisex products made by Malin+Goetz, a New York cosmetics brand. There are three tubes of Vitamin E Face Moisturiser, Vitamin B5 Hand Treatment and Lip Moisturiser, which have natural ingredients and are very good for a sensitive skin. There is a toothbrush, with a tube of Colgate, and for once on an airline, you get a decent, largish, tube of toothpast, not the normal weeny sized one. There are also earplugs, eyeshades, and socks. 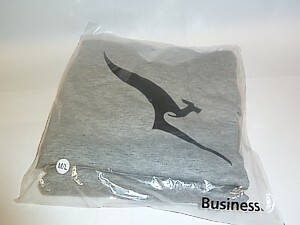 One other thing to not miss out on when flying Qantas are the pyjamas, even in Business Class. The Qantas Business Class pyjamas are by your seat when you sit down, in a plastic packet. They have long arms, but are of a very thin material: ideal for hot flights, and of course feature Qantas' roo on the front. 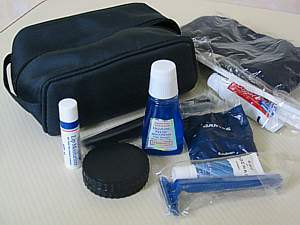 The Qantas economy class amenity kit has a clip together toothbrush, with nondescript industrial toothpaste in a minute tube at the bottom, an eyeshade, and socks. 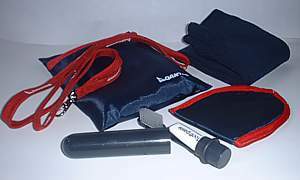 It all comes in a wonderful pouch with a hang around your kneck clip. The bag itself must have cost far more than what's inside it, and it's worth keeping. 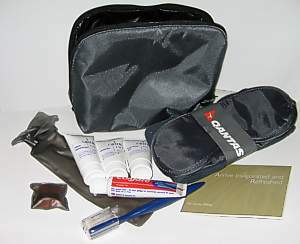 Qantas of course has a long history of amenity kits. The information below is out of date, and shows the older versions that are no longer available. The business kitbag has a toothbrush, and a moderately sized tube of colgate toothpaste, and a schick razor. There is a tube of Caire Moisturiser, cleanser (with a packet of cotton wool) and a tube of hydration gel. The Caire Facial Mist is great - hold six inches away from your face for a quick wakeup call. There are also some decent socks, earplugs and an eyeshade. It comes in a pretty good logoed washbag, with Qantas labels on the zip, and an instruction manual. The business kitbag has a toothbrush, and colgate toothpaste, a razor and shaving cream, mouthwash, and lip moisturiser, plus earplugs and eyeshade. All in a nice kitbag, with a zip with little Qantas labels. The First amenity bag has few extras. There's a toothbrush, and Colgate toothpaste, a razor and shaving cream, mouthwash, and lip moisturiser, plus earplugs and eyeshade. However there is a Natio moisturiser and a Naito "face moist" face spray. Which all proves that naming things is not an Australian strong point. It comes in a slightly bigger kitbag, with a fiddly Velcro strap at the front. Qantas has a pretty standard baggage allowance for each flight. International Cabin Bags: Economy Class passengers can take hand luggage of one bag weighing up to 7kgs into the cabin, First, Business and Premium Economy class can take two. They must be no larger than 48cm (19in) x 34cm (13in) x 23cm (9in), unless it is a non rigid garment bag, in which case you can have 60cm (24in) x 114cm (45in) x 11cm (4in) (but only one bag is permitted in this case). Rules on contents (such as liquids) apply. Domestic Cabin Bags: All classes of passenger can take hand luggage of two bags weighing up to 7kgs into the cabin. They must be no larger than 48cm (19in) x 34cm (13in) x 23cm (9in), unless it is a non rigid garment bag, in which case you can have one of the smaller bags, and one of the larger ones. Rules on contents (such as liquids) apply. All Dash 8 aircraft have a limit of one bag - and remember, with the Dash 8 the overhead lockers are tiny. International Check in luggage: On all routes except to the United States there are no restrictions on the number of bags you can check in. Economy class (& premium economy) can check bags weighing 23kg (50lb), business class can check in a total weight of 30kg (66lb), and First class can check bags up to 40kg. Routes to or via the United States use the piece concept, and have economy with two bag allowed to 23kg each, business class & First with two bags (32kg max each bag). Total dimensions of the 2 pieces must not exceed 270cm (106in) with no 1 piece exceeding 158cm (62in). Domestic check in luggage: There are no restriction on the number of pieces you can check in. Business has a total weight limit of 30kg (66lb), while economy is 23kg (50lb). The total dimensions of each piece must not exceed 140cm (54in), and no piece can exceed 32kg (70lb). Qantas Club Members and Gold / Silver Frequent Flyers gain an extra 10kg checked in luggage allowance (or one piece for US flights), while Platinum Frequent Flyers gain an extra 15kg of checked in luggage allowance. Qantas's website has details of exactly what you can take onto a flight.